With the season of shopping rapidly approaching I thought it would be nice to take a trip down memory lane and share some of my all-time favorite gifts that I have ever received from loved ones. Just to clarify this is not a bragging post by any means. I am very grateful for every and all gifts I have ever gotten. I have several loved ones who love to spoil me and who I love to spoil right back! I just want to share the ones that meant the absolute most to me. One. 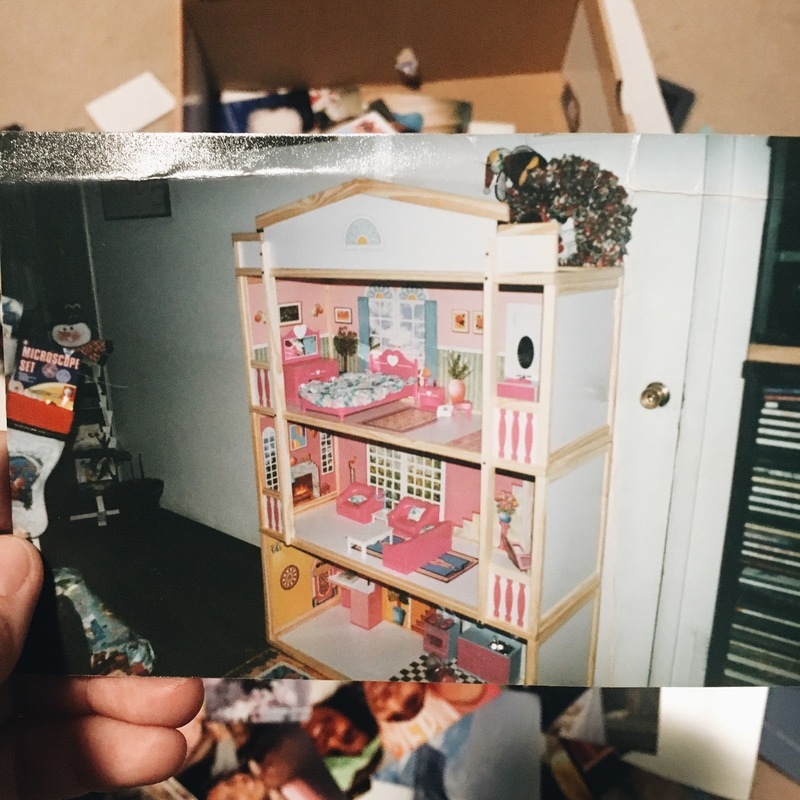 The Dollhouse // I can't remember how old I was exactly, but young enough to still play with Barbies. I came down the stairs one Christmas morning and my rubbed my little eyes to see this gigantic dollhouse right in front me. I'm a short girl in general, but I couldn't have been more than 3 ft. tall, because this thing was HUGE compared to me. It was three floors, with multiple rooms, and even completed with furniture. It was seriously every little girl's Barbie Dream House come true. The best apart about this though is years later my mom tells the story about how my dad struggled to put it together. She said he had worked on it all night, cursing under his breath, because it wasn't as easy as it had looked. This made me love it even more. Seriously, one of the best gifts ever. Two. Macbook Pro // When I got my Macbook Pro I cried. It was one of those gifts that was so completely unexpected it just warmed my heart to open it. All I had asked for for Christmas was gift cards to the Apple Store, because I knew between Christmas and my birthday in February I would have a good amount to put down towards a Macbook. After a busy Christmas morning, my mom tells us to come back to the living room, because we forgot one gift. Turns out it was for me so I started to open it and to be honest I thought it was a really mean joke when I opened it and saw a white Apple box staring at me. It wasn't a joke though, my parent's had gotten me my very own Macbook and I've used this bad boy ever since then. Even though it's almost seven years old, it's still one of my most precious gifts because it was completely unexpected. Three. New York for New Year's Eve // I love New York, as you can probably tell by now. However, something I have always wanted to do was to attend New Year's Eve in New York City. I just always thought this would be a cool experience, and I was right. A couple year's ago Omar surprised me by setting up a trip to NYC for New Year's Eve! It's not like a talked about it forever, I probably only mentioned it once, but he remembered and set up the whole thing. It was an incredible experience and I'm so happy I can cross it off my bucket list. Four. Juicy Couture Locket // Rocio has always been good at buying me gifts, but one of my most cherished gifts she has ever gotten me was for my 21st birthday. She got me this rose-gold statement bracelet (seen in this blog post) from Juicy Couture (which I am low-key obsessed with) and it turns out the charm dangling from it is a locket. When you open up the heart locket there is a picture of Rocio and I from freshmen homecoming and let me tell you... it's as awful as it sounds! I about cried of laughter at how horribly awesome this gift was. And I was only influenced by the martini's I was also sipping on just a little bit. Five. Disney // What little kids doesn't want to go to Disneyland? My parents had gotten us suitcases with our nicknames stitched onto them, Mickey Mouse ears, and Christmas ornaments of Minnie & Mickey and yet, we were still super confused as they pointed the video camera (Yup, I am that old) in our faces as we tried to guess why we were having a mouse-filled Christmas. To say the least, we were pretty damn excited when our parent's finally spilled the beans and there's nothing quite as magical as Disneyland. Six. Anything From Gabe // Gabe and I have been friends for almost twenty years, which means we've exchanged a gift or two throughout the years. I think it's the story that goes behind the gifts, rather than the gift itself that just warms my heart. Like last year, he went to three different stores to find a book that I wanted. A BOOK! Or the fact that he got me a Mexico soccer jersey with my name on the back and the number jersey we shared in high school. My favorite one though, is when we were in grade school and he had cut out a picture of a cat and in his second grade handwriting he wrote To: Chelle Frum: Gab-o. It's so wonderfully mispelled, it was awesome. So basically, anything Gabe gets for me will always make me smile. Seven. My First Big-Girl Bike // Let's be honest, grandparents dominate Christmas. If there's anyone who a parent loves to spoil more than their own, it's their grandchildren. My brother and I were no exception to this each year when we would go to our Nanny and Pap-Pap's and saw that the pile of gifts were as high as the tree. Except one year, after we ate a ton of Christmas cookies and started to play with our new toys, our grandpa brought out two bikes! I absolutely fell in love with mine. It was a metallic blue with a green tint to it, shiny black accessories, and green and blue tassels hanging from the side. I had a bell, a basket, and even a place for my water bottle. I rode that bike for years and was honestly super upset when I outgrew it. This has to be one of my favorite gifts ever, because I can still remember my Pap-Pap's face as my brother and I rode in circles outside on Christmas day and every bike ride after that. It's gifts like these, the ones that come with memories that make them my absolute favorite. What are some of your favorite gifts?